The Tory government has given Northamptonshire County Council (NCC) permission to use £60 million from the sale of its headquarters, One Angel Square, to fund essential services. Allowing NCC to do this is unusual and clearly a political move to prevent Tory government ministers from having to directly bail out the Tory local authority. The Socialist Party opposes selling off public buildings like One Angel Square. But it does show that councils can use capital receipts to refuse to carry through austerity. The government is weak. A campaign by Labour councils that fights to win the money needed to fund services from the government could be part of the campaign to get the Tories out. Struggling NCC was effectively bankrupt at the end of 2017. It has since been subject to two separate Section 114 notices, banning officers from any new spending on anything except core, mandatory services, such as social care. This cash injection will likely spare NCC the embarrassment of declaring itself insolvent for the third time this year. But it won't spare working-class people the pain of austerity. A recent damning Ofsted report into the county's failing children's services highlighted numerous issues, including many vulnerable children being left without a social worker and serious cases being left unassigned for months. NCC has completely failed to address the seriousness of the situation. They have continued along the path of austerity - planned poverty of the working class to pay for the economic crisis. The Tory government's cuts to local-authority funding have driven this crisis. NCC is not the only council on the brink of financial collapse. Residents in the county have expressed their anger and there have been numerous protests by Save Northants Services outside County Hall in Northampton. But anger is not enough. Cuts will continue despite the £60-million cash injection from the headquarters sale if a mass campaign of the trade unions, workforce and the community to resist the cuts and force extra funding from the government isn't built. Workers should not suffer from Tory austerity. We stand by Northamptonshire's residents, putting forward an alternative to the utter failure of the current local authority. Cuts and privatisation must be immediately reversed. 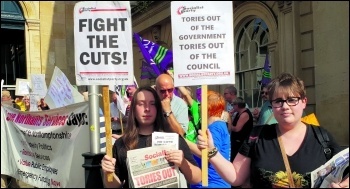 Campaigners are demanding the council resign and new elections be held to give local people an anti-austerity alternative to Tory cuts. The Socialist Party says that it's vital that any candidates aiming to replace the Tories back a no-cuts budget.